The good news up here in Alaska is that the light is coming back. It’s 6 p.m. and still light, such a luxury after the long siege of winter darkness. Each year around this time something inside my chest thumps and I feel a strange trilling inside my veins, almost as if my blood is singing, as if part of me is coming back to life. Another thing that brings me great joy this time of the year? 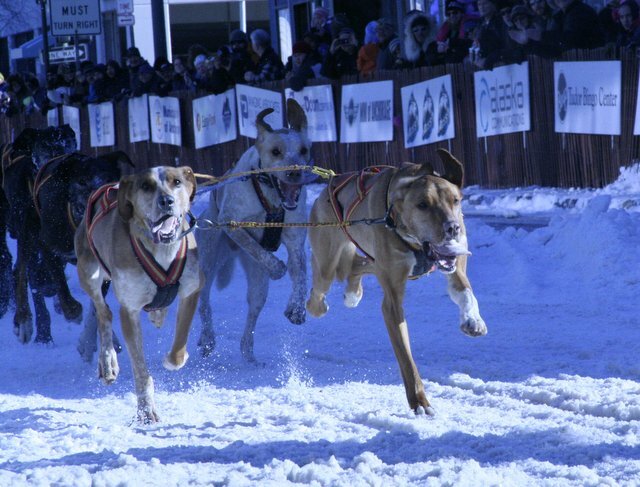 Sled dog races. 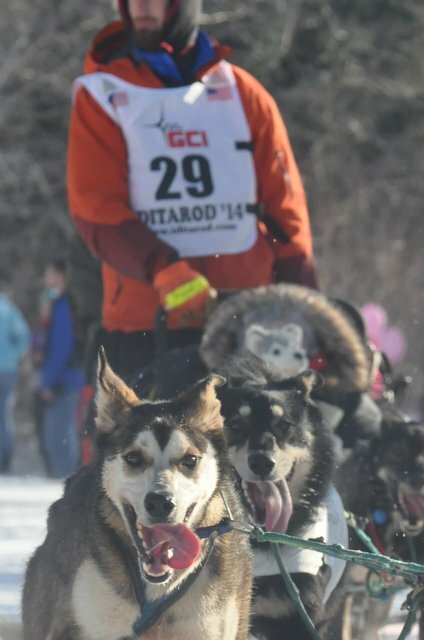 Last week was the Fur Rondy World Championship Sled Dog Races and earlier today was the ceremonial start (i.e., fake start for publicity’s sake) of the Iditarod Sled Dog Race. 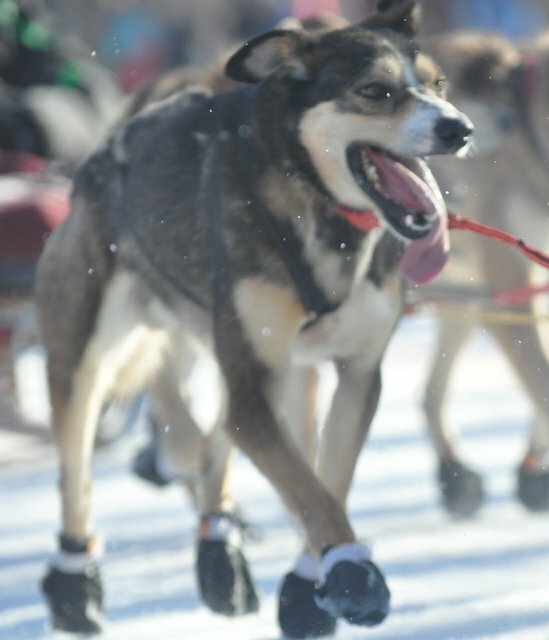 Watching these dogs run does something to be. It reminds me of the wild and fierce place deep inside of me, the place I normally keep hidden during my daily interactions, the place that surfaces when I run trails and mountains and feel the thump of my own blood and feel so damned alive that I often cry. But enough of myself. 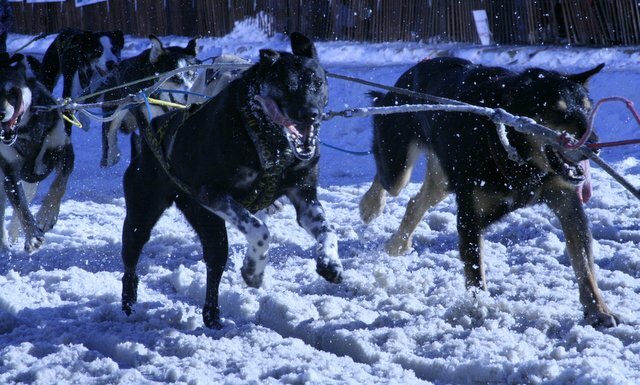 It’s time to introduce some really fast dogs. 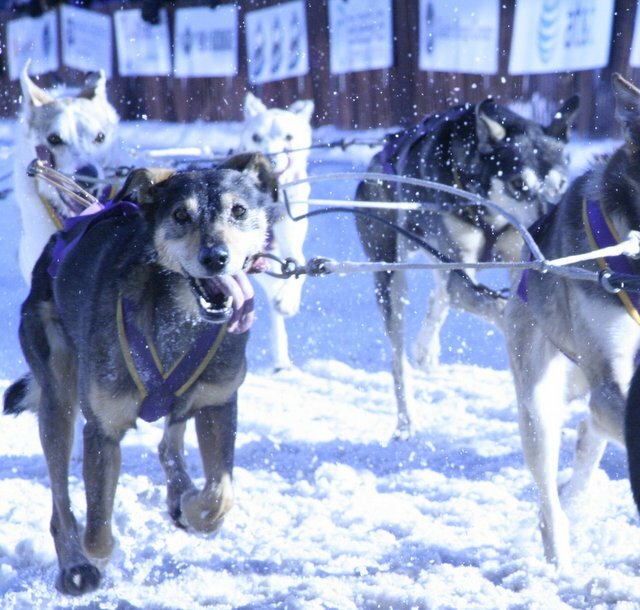 All of the above are from the World Championship Sled Dog Races, which were held last week in Anchorage. 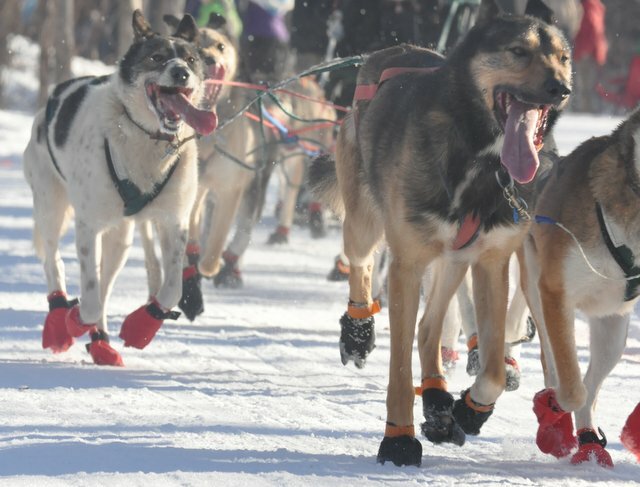 It’s a shorter distance and considered more of a sprint: Three days repeating a 25-mile course that winds through the downtown city streets and then off through the Cambell Creek greenbelt. 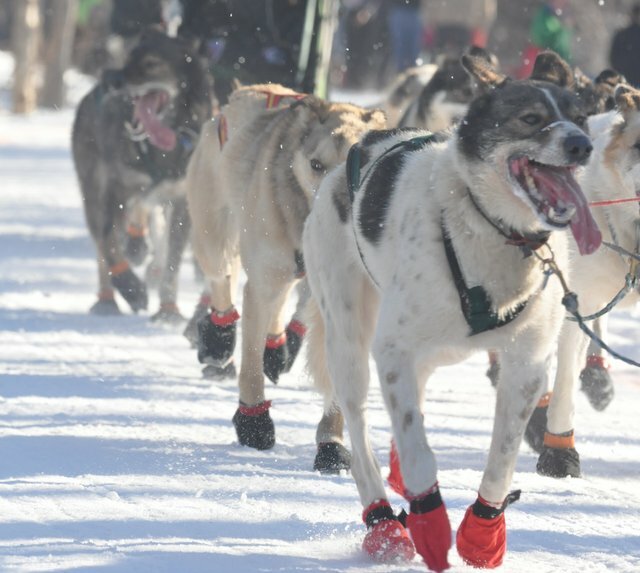 The dogs are geared for speed more than distance; notice the difference in the Iditarod dogs below. They’re huskier, longer-haired and moving much more slowly. As far as writing, well, I haven’t been writing much this past week. I’m struggling over the edits for my second novel, which is finished except for the last two pages. Why are those last two pages so difficult? Probably because endings carry such a heavy weight. They are so vital. They sum up the mood of the entire book. Mostly, though, I can’t let go. I don’t want to leave this world I’ve created, this world I’ve lived inside for the past three years. Where will my characters go? Will they live on without me? Or will they simply disappear inside the book, cemented down forever on the pages without any hope of rising up and changing their situations or lifestyles? It’s a heady responsibility, bringing characters to life. It’s a bit like playing god. Which is why I watched the dog races instead. 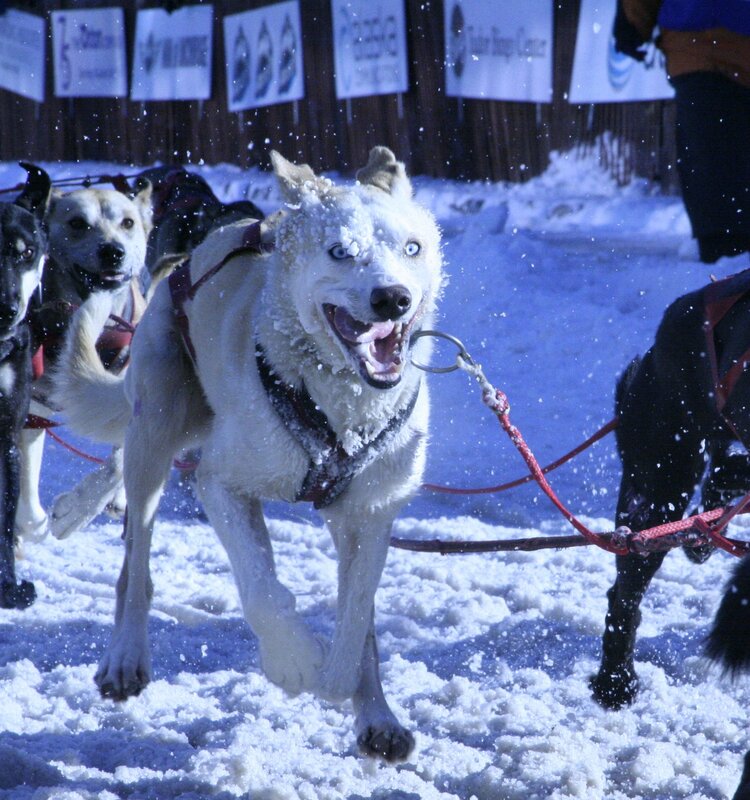 There’s something primal and satisfying in watching animals run. They are so completely themselves. They have no idea of their beauty. It’s much like watching children run barefoot through the grass. Why, oh why, must we grow up and become stilted and self-conscious? Women read more books than men. Yet every year, according to counts conducted by VIDA, most major publications run more book reviews by men than by women, and review more books by men than by women. In 2013, for example, the Lond Review of Books had 195 male book reviewers to 43 women reviewers: a ratio of almost 4-to-1. The New York Review of Books was in the same ballpark, with 212 male reviewers to 52 female ones. In a world with more female readers than male ones, how does that happen? It’s still a man’s world, unfortunately, especially in the literary arena. Anne Sexton was mocked for writing poems about ordinary domestic situations and things haven’t changed much in the over 40 years (40 years!) since. Romance is seen as unserious and frivolous because women are seen as unserious and frivolous, and romance is written largely by women, for women, about concerns traditionally seen as feminine (Jennifer Weiner and Jodi Picoult have made a similar argument about commercial fiction by women). I wouldn’t argue that the LRB and similar publications need to cover romance if they want to get more female book reviewers. But I would say that the mind-set that says that romance novels are automatically trash is linked to the mind-set that prevents these venues from publishing more women writers. But the best thing about the article? It was written by Noah Berlatsky. A man. I know, Lynn! Noah is my new hero. Cheers and happy writing. I knew that if anyone could appreciate the booties it would be you, Jackie. As far as cursing, did you read the Salon article and what the London Review of Book said about women writers, how they basically blamed us for not taking writing seriously enough and, gasp!, daring to also have a domestic life, because of course everyone knows that you can’t have both, only men can have it both ways, right, and that’s usually because there’s a woman behind them holding them up. Whew, I’ll stop ranting right now. Cheers and happy writing (today I wore wool socks and sandals. You would have been so proud, Jackie!). Oh, my, gosh. The photos of the dogs are so crazy great – I love dogs. 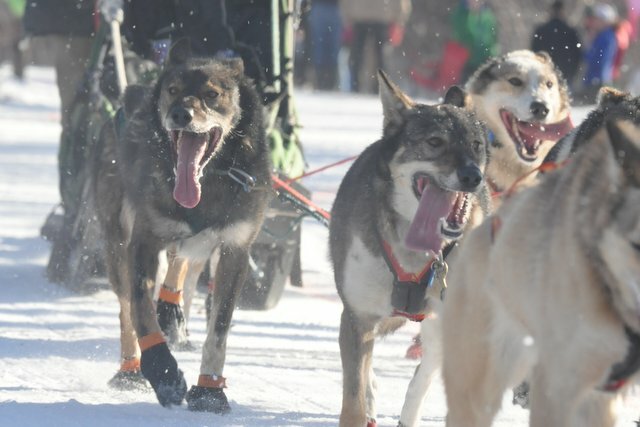 Love seeing them in motion, their tongues hanging out, the determination in their eyes. So glad to hear the light is coming back – I supposed the Earth’s axis is beginning to work in your favor?